Located in the beautiful Pocono Mountains of Northeastern Pennsylvania, the Monroe County Beekeepers Association is an organization whose members share common interests, concerns and camaraderie in beekeeping. MCBA provides a forum whereby members have learned beekeeping skills since 1977. Continuing education in beekeeping is promoted through mentoring and guest speakers/demonstrations at monthly meetings. 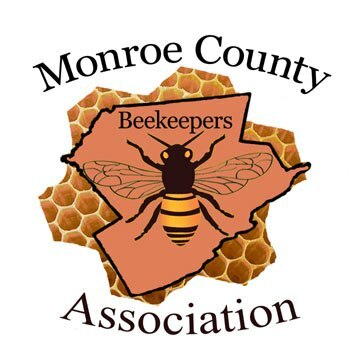 The Monroe County Beekeepers Association is dedicated to keeping its members informed of current beekeeping trends and assists its members to achieve high levels of confidence, skill and quality in bee management techniques. 1. Lay your parchment paper down on the large baking sheet and evenly coat with non-stick cooking spray. This will keep the lollipops from sticking while hardening. 2. Lay the candy sticks down next to each other a few inches a part across the parchment paper. 3. Add a few ice cubes to a small glass and fill with water and set aside. 4. Add the honey into a small saucepan and heat through. Bring to a boil, stirring continuously until the temperature of the honey reaches 300 degrees. You can test this by adding the candy thermometer to the cooking honey. 5. Once the honey has reached 300 degrees you can test the honey by putting a few drops into the ice water. If the honey hardens immediately upon touching the surface of the water you are good to go. 6. Slowly pour the heated honey onto the top portion of the Wilton candy sticks. Use a large spoon if needed. 7. Repeat until all the honey is used.